While Americans are hitting the back-to-school sales at a fever pitch, students across Germany will return to hit the books sometime between the beginning of August and the beginning of September. The first day of school for former kindergartners in Germany is a cause for celebration, a ceremony, and gifts. Sarah Reader, Beaverton native and current resident of Mittweida, Germany, tells us more. German children gear up for their first day of school for almost a year, during which time they have preschool lessons in kindergarten. Kindergarten in Germany is not compulsory and could be considered a blend of daycare and preschool rather than the first year of school as it is in the United States. German children can attend kindergarten between the ages of 3 and 6. The preschool year of kindergarten for the five year olds includes weekly school-like lessons, during which the children work on projects; learn about letters, numbers, and words; and go on excursions. Near the end of the year the children also visit the nearby elementary schools which they will attend in the approaching school year. They meet their teachers, see their classrooms, and even sit at real school desks for the first time, all the while becoming more and more excited about the next phase of their lives: school. But German children don’t just get on the big yellow bus on the first day of school and ride to their elementary school: in fact, there are no big yellow school buses. The first day of school for the incoming first grade class isn’t even on a Monday, but rather a Saturday! Saturday school may sound depressing, or even like a punishment, but it’s a cause of great excitement for Germany’s six year olds and their families. Each new first grade class at the local elementary school has a time slot on the Saturday before the new school year begins. Families and their new first graders file into the school auditorium; are treated to a skit by older students who will be entering second, third, and fourth grades; and listen to a speech by the principal. The new first graders even bring their backpacks to school and after the show they accompany their new teacher to their classroom. There, a symbolic class period is held. When the ceremony finishes, the families and children are reunited, and the children then receive their “Zuckertüten.” Literally translated, the Zuckertüte is a sugar bag; it’s actually a cone-shaped cardboard package bursting at the seams with sweets and school supplies and is usually topped with a new toy or stuffed animal for the new pupil. It is presented to the children individually by their new teacher at the end of their symbolic first day of school. Another name for it is “Schultüte,” or school bag. This name is used in the western states of Germany, but this school bag is only used on the very first day of first grade! My own son Wilhelm with his Zuckertüte. The history of the Zuckertüte is rich and varied. It cannot be summed up briefly as I was told by collector and expert Hans-Günter Löwe. He is a retired schoolteacher from Hamburg, Germany, and has collected Zuckertüten for over 30 years. He has even written a book on the subject, which is only available in German: Schulanfang – Ein Beitrag zur Geschichte der Schultüte (Starting School: The History of the Schultüte). He says the tradition has been traced all the way back to 1817 in the city of Jena in the eastern German state of Thuringia. According to the Jena City Museum, at that time some children received a small paper cone filled with cookies on the first day of school. They were either given the cone or they picked it from a tree. The tradition spread to the other big cities in the states of Thuringia and Saxony and also to nearby regions such as Silesia and Bohemia—today parts of Poland and the Czech Republic. By 1910 the first day of school treats were also being presented to children in the western regions of Germany. For a long time only rich children received gifts and treats on the first day of school in the festive packaging. Children from poor families considered it a gift to even be allowed to go to school, rather than having to work in factories or on farms. All of the Zuckertüten for the incoming class. But in the eastern states of Germany, simply receiving the Zuckertüte is not the only highlight for children leaving kindergarten and entering their first year of formal schooling. There is also usually a celebration for the children who are nearing the end of preschool, a kind of coming-of-age party when they leave the playful times of kindergarten behind and enter the world of formal schooling. This celebration, called the Zuckertütenfest, could be compared to a kindergarten graduation in the United States. It marks a significant milestone in the children’s lives: a shift from learning through play to more serious learning. The difference, however, lies in the form of the celebration. While a kindergarten graduation is similar to a high school or university graduation ceremony, with caps and gowns and a reception for the young learners, the Zuckertütenfest in Germany is a showcase of what the young scholars have learned. The celebration seems to be especially widespread in the German states of Saxony and Thuringia. The Zuckertütenfest may include a performance like a concert or play, or it may entail an event such as a treasure hunt during which the children solve tasks that incorporate what they have learned during their preschool year. Volker Voigt of Leipzig, Germany, told me that the children leaving the kindergarten which his children attend hold a performance each year before the new school year begins. The children sing and perform skits about kindergarten and school for their families. An important aspect of the event is the Zuckertütenbaum, the tree upon which the cone-shaped treat bags “grow.” Often, like at Kindergarten cocolores in Dresden, the children go for a walk as part of the end-of-year celebration, and upon their return, the treat cones have magically appeared on a tree in the kindergarten’s yard. Sometimes the children have even gone to great lengths in hopes of growing big treat bags and watered their selected Zuckertütenbaum with sugar water. 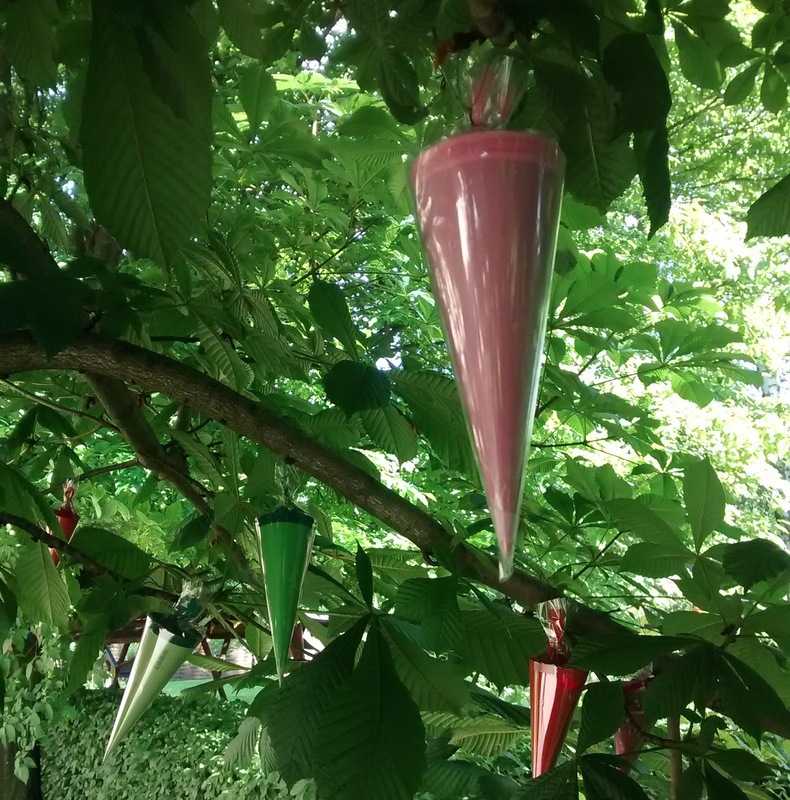 Anke Poppitz of Mittweida, Germany, reports having made small cones out of paper as a child with her preschool group and hanging them on a tree outside of her kindergarten. After hanging the cones on the tree, they watered it and were even allowed to take their afternoon nap under the Zuckertütenbaum. Later the children went on an excursion, and when they returned, larger treat bags had appeared! The most involved Zuckertütenfest I have heard of takes place at Kindergarten Goethehain in Mittweida, Germany, and I was lucky enough to accompany this year’s preschool group on their Zuckertütenfest excursion this year. The excitement starts several weeks before the actual celebration, when the children choose a tree on the kindergarten playground to water with sugar water, dreaming of big Zucktertüten. Every day the preschoolers check the tree, until one day, blossoms appear! 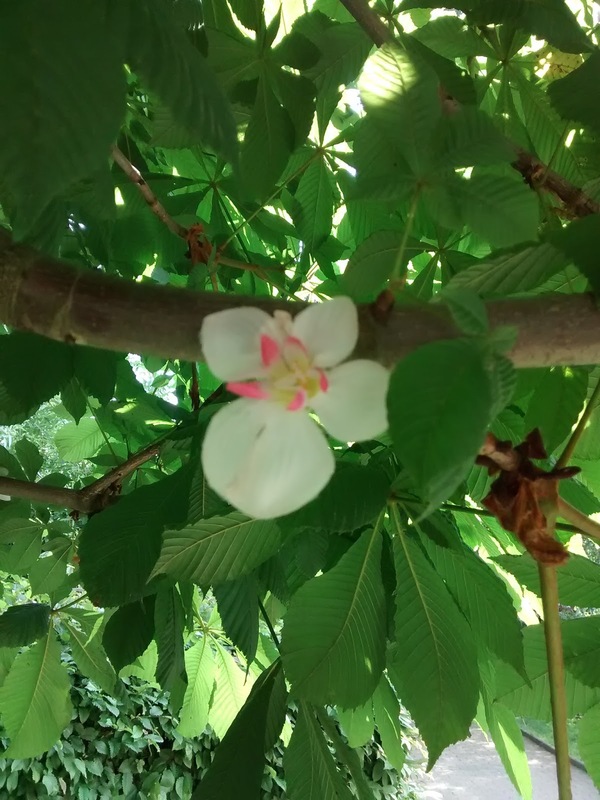 One of the first blossoms on the Zuckertütenbaum. The first tiny Zuckertüten appear. One week later, they've grown in size. A few days after the blossoms appear on the Zuckertütenbaum, tiny conic treat bags appear in their place overnight. The children continue watering the tree by day, and as the Zuckertütenfest approaches, the treat cones increase in size. Finally, on the day of the big event, the children arrive at the kindergarten in the morning, have breakfast together, and then they check the tree. The Zuckertüten have disappeared, and a bag with a letter and a treasure map is all that’s left. A treasure map was left in place of the stolen Zuckertüten. This is a tradition that has evolved over the years at Kindergarten Goethehain: the children’s treat bags are stolen each year by a character from a children’s book, and the children have to act as detectives, following the clues on a treasure map to solve some puzzles in order to find the treat bags. This year a fox named Karl-August stole the Zuckertüten. The preschoolers know him from a book. As a fox of course he’s quite sly, and they like him because he loves to eat Nutella, that delicious European chocolate-hazelnut cream that the kids also enjoy. Clearly he wants whatever is inside those Zuckertüten, too! The hunt begins: Karl-August left the children a letter and a treasure map, now it’s time for the preschoolers to put the things they learned over the past year to the test and see if they can solve the tasks presented along the way in order to ultimately recover the stolen Zuckertüten. First, the map is examined and the kids check if they recognize any of the places that the sly fox has sketched out for them. There are several stations throughout the town and into the nearby countryside, all places the children have visited before and recognize on the map. The group starts at the kindergarten at 8:30 in the morning and embarks on an all-day hike. The children check the map to find the first station on their hunt, which is the bus station near downtown Mittweida. There, each child has to complete the first task of the day: saying their name, address, birthday, and age. When that step is complete, the next stop on the hunt is deciphered from the treasure map and we head on our way. The second stop, an event center with a large public garden in an old farm ensemble on the edge of town, is quite exciting: we find tracks in the sand! Could they be Karl-August’s tracks? Again, the children have tasks to complete. At the farm they have to name insects and flowers that they have learned about. From here we head into the forest on the edge of town and to a small stream, where the children need to fold origami boats and float them on the stream. The children are searching for their missing Zuckertüten. After this, the group heads toward the Zschopau River. Along the way we happen across the old fox farm, where foxes used to be bred for fur; today the former farm is in private ownership and a family lives there. We learn here that Karl-August, that tricky fox, was actually born here and escaped. The children’s next job is to name trees that they can find in the forest. The path continues into the woods, where we walk past some beautiful cliffs and then into the Zschopau River valley, building a small bridge along the way and naming animals who live in the forest habitat. The next station is at a large park and recreation area next to the Zschopau River, where we stop for a lunch break and some time at the playground. There the children name all of the fruits and vegetables that they know and are even treated to ice cream. After listening to a story about a fox, the group continues to the ferry, which takes us from Lauenhain on the edge of Mittweida back closer to the city center, where we finally hike back through the forest and ultimately back to the kindergarten. The group arrived back at the kindergarten at shortly after 3:00 pm, without the lost Zuckertüten! The preschoolers' families had arrived at the kindergarten by this time, and had set up drinks and snacks at the outdoor picnic tables, where the exhausted children (and teachers!) could take a break in the shade. Then, while everyone was resting, we heard a siren. It came closer, and finally the police pulled into the back gate of the kindergarten! The children ran over to the police car, sure that the police must have arrested that sly fox Karl-August, and they had! The police had even recovered the Zuckertüten: there was one for every preschooler. The police had arrested the fox and recovered the stolen Zuckertüten! Here is one happy preschooler! As you can see, the Zuckertütenfest and the first day of school are very special coming-of-age celebrations which mark the end of the early childhood years and the start of a new and exciting phase of education for children in Germany. In John Elder Robison’s latest book on the subject of autism, the author describes in captivating detail his participation in experiments on a new brain therapy that could be a game changer for people with autism. Robison himself has autism, and in his previous books has described growing up different without knowing why he was an outsider in Look Me in the Eye, given tips to autistic people and for living and working with autistic people in Be Different, and provided an intimate glimpse into raising his son Jack who is also on the autism spectrum in Raising Cubby. His fourth book, Switched On, provides a thorough account of his participation in experiments on transcranial magnetic stimulation (TMS) as a therapy for autism. This therapy has previously been used with success on patients with depression. Robison grew up in a family scarred by mental illness and was always an outsider in the worlds of school and work, never staying on the beaten path but doing very well for himself all the same. Without a college education, he worked for the band KISS, designing their flaming guitars. Later he went on to work for a toy company and engineered the first speaking toys. Currently he owns JE Robison Service, a repair shop specialized in imported cars in Springfield, Massachusetts, works as a freelance photographer, author, and is an autism speaker, educator, and consultant. When Robison was 40, a friend carefully suggested to him that he may be on the autism spectrum. Robison chose to explore this, and was in fact diagnosed with autism as an adult. 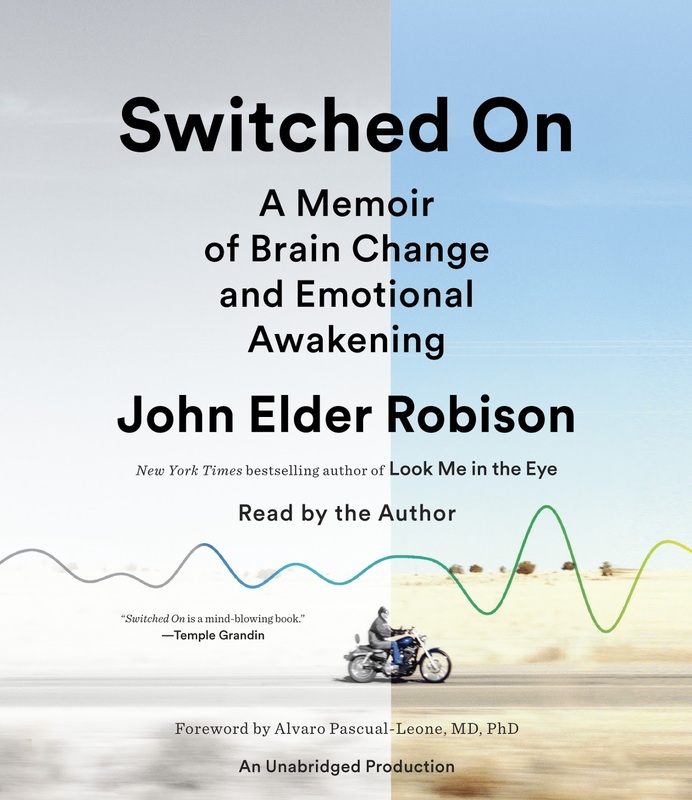 In Switched On, Robison describes how his understanding of the world and his relationships changed as a result of the TMS treatments. Further, he provides a glimpse into the science behind TMS, the procedure itself, and the history of brain study and brain therapies. The detail in which the author describes the history of neuroscience and some early studies using animals and human patients is at times uncomfortable and difficult to listen to. At the same time, it is truly fascinating to have the current TMS experiments put into a historical perspective and to consider how people might view today’s experiments from an ethical standpoint one hundred years from now. Robison describes the process he underwent right from the beginning, from being approached to participate in the study, signing the consent forms, and going through the first rounds of the experiment. Listening to Robison explain how he felt going into the hospital and preparing for the experiments, along with the questions he asked the researchers, gives a rare and riveting account of the TMS process, not just from the technical side, but also from the patient’s perspective. I find Robison’s detailed narratives to be one of his great strengths as an author, but some listeners may find the precise descriptions and technical terminology uninteresting or even annoying. The doctors conducting the TMS study with Robison and other autistic adults repeatedly told the patients that they might experience changes in their emotions and perceptions, but that the changes would be temporary: the effects of TMS weaken and disappear over time. However, they did not mention what kind of changes the patients might notice or what exactly they were looking for in the study, leading Robison to wonder just what was going to happen to him. This did not deter him; rather, he forged ahead to participate in the study. His account of the changes in emotions that he felt himself, reading others’ emotions, and even hallucinogenic experiences following TMS treatments were gripping and, at times, even frightening. It was truly valuable at this point to have read John’s previous books and have already become familiar with his reflections on his interactions with others and his personal experience of the world as a person with autism before diving into Switched On. He always does an excellent job describing how he experiences the world, and his report in Switched On about his changed emotions and altered perception of others’ feelings and the world around him is phenomenal. This book is not in any way advertising for TMS as a “cure” for autism. There is a lot of pseudoscience circulating about the causes of autism and treatments or cures for it, feeding a lot of false hope in particular to parents of autistic children. This book does not do that. It is an honest account of Robison’s personal experience with TMS treatments. He examines the treatment from all sides, providing a gripping account of his experience, but also demonstrating the potential of the human brain to change and make new connections, once again underscoring the concept of brain plasticity which he has written about in his previous books. Being familiar with Robison’s outspoken position as an autism advocate in favor of acceptance for people who vary from the norm, people who are not neurotypical but exceptional, I was very curious about his experience with TMS and its effects on his inner life, understanding of the world, and his interpersonal relationships. Switched On presents a detailed and fascinating account of one autistic man’s experience undergoing TMS, but looks at the treatment from a number of perspectives and considers drawbacks, limitations, ethical questions, and dangers of the treatment as well. 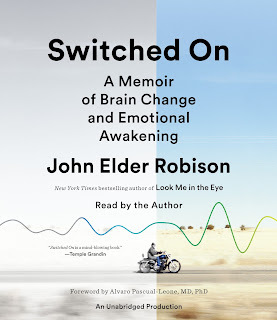 Switched On was another of Robison’s books that left me wishing the book wouldn’t end, wondering, “What’s next?” The audiobook version is an absolute pleasure to listen to. The opportunity to hear John himself telling the story of his journey with TMS in his clear and even-keeled voice was enthralling. Listeners who have heard Robison speak or listened to one of his earlier audiobooks will notice the change in his voice following the TMS treatments. Previously his voice had an almost robotic quality, now he has added prosody in his still calm and crisp voice. The only drawback I found to listening to the audiobook is that I did not have the opportunity to reread some of the technical descriptions of the treatment or other passages that I would have liked to read a second time in more detail. Overall, this book is an outstanding memoir on one man’s perception and changes he experienced as a result of the TMS experiments and is fascinating for anyone with an interest in autism or how the brain works.